Ask fellow campers about "Raccoon River Campground" and nearby attractions. We had a nice week stay here at the end of JULY in FL, it was pleasant, restrooms were a/c and clean mostly - its mostly a issue with other people just not cleaning up after themselves. close to beach but we chose to go to a different public beach about 5 miles down the beach/pier beach was crowded. had only 1 issue and not parks problem really but take fire ant protector - fl is covered in fire ants, only 1 person out of 7 of us staying in our camper was bitten. we were in popup camper and just had bought but we had a very pleasant stay here, it was shady and campers were so close that you couldn't enjoy your own space. it was really nice and close to everything you needed to be close to. We camped at Raccoon River Campground in a Travel Trailer. The campground has tall pine trees which leaked out pine sap on my new 2017 Ford F250. The bathrooms were a little dirty. The owner was very stern about not working with us on another site. Could not rent a 50 amp site instead of a 30 amp even though I had a adapter. Customer service was very poor. Owner is not very accommodating considering being out of town. Fought getting sand in the camper the whole time. Would not reccomend Racoon River to any of my friends. We camped at Raccoon River Campground in a Travel Trailer. Panama City is my favorite place to go, but Racoon River is out now. We loved the campground! The sites are narrow, but very nice. The pools could be spruced up a bit, but that would be our only complaint. Just a short walk to the beach. We will stay here again. We camped at Raccoon River Campground in a Travel Trailer. The shade is amazing! The campground is so wooded, you forget you're at the beach. Definitely helps with the high winds. We had our awning out the entire time without any problems. Campground is nice and clean. There was some minor "thru" traffic during the day while the gate was open but it was closed in the evening so only campground traffic. The walk to the beach wasn't too bad. We went with friends and neither one of our sites were level (we had to use two boards under our wheels). My only complaint about the campground would be the limit on the Wi-Fi (it would kick you off after just a few minutes). We have AT&T phone service and had no problems with coverage. We camped at Raccoon River Campground in a Fifth Wheel. Was given a campsite, and they said they were doing me a favor moving me closer to a friend. I have a 31 ft. pull behind with a slide on both sides. They put me in 111. The campsite is so tight that I could not open my tarp. The cable did not work, and I had to back out of the site when we left! Will consider another campground next trip. We camped at Raccoon River Campground in a Travel Trailer. The close proximity to the beach and pools are what really makes this park. Slightly overpriced but it is a tourist town. You really can't beat the private trail to the beach though. You do have to cross a very busy street just before the beach access. Was a great place for families with kids. We camped at Raccoon River Campground in a Motorhome. Eat at the Shrimp Basket! Best shrimp etouffee ever! This is an older park with some attributes. They have 2 pools that look nice and a big playground for young children. I didn't use the laundry room or showers but they and the office were old buildings. A lot of the sites are tight to get into and people park where they can. The sites are well shaded which is great in the heat. The sites are dirt and have lots of pine needles. There was a patio area and picnic table at my site. I thought it was a bit expensive for off season. We camped at Raccoon River Campground in a Motorhome. It is a nice short walk to the beach, mini golf and restaurants. First, the only negative that I have is that I booked a spot 4 months ago, but when I got here I was given probably the worst spot available. The trailer's slide next to us was almost on top of our patio pad. There were other sites available that I could have moved to but the trailer next to us came after I was unhooked so we decided not to bother asking if we could move. We didn't spend much time at our site anyway . The beach is in walking distance but seems long when you have to carry all your gear. The campground has all the amenities that you would need and is situated next to Shipwreck Island Water Park, which looks like a lot of fun if you have young children and fun for adults as well. 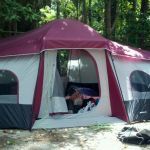 The campground's location was convenient to near by shopping and all the different attractions Panama City beach has to offer. I would stay here again but I would requests spots 82-91 definitely stay away from sites 70-75. I'm sure these spots were created before trailers had slides because our neighbor's slides were more than over the boundary lines. We felt cocooned in our site! We camped at Raccoon River Campground in a Fifth Wheel. Be sure to bring a wagon to transport all your gear to the beach. We purchased a folding one at Walmart for 40.00 it was great; we used it everyday. We also purchased an umbrella. You'll definitely need it on the beaches here, especially in the summer. Be sure to visit Shell Island, bring your wagon and umbrella. It was a highlight! Don't let the Disney font fool you. The location is wonderful. Close to the beach and great activities. Restaurants numerous and nearby. The restrooms are dated. One shower looked to have been inoperable for awhile. Our site (#85) was littered with cigarette butts and an old RV sewer line . The pool had tattered and torn umbrellas and cigarette butts were everywhere. Office staff was none too friendly and seemed offended when asked for our military discount. Overall not a good park except for location. We camped at Raccoon River Campground in a Travel Trailer. The park was originally built like an old west town (think "Tombstone", gunfighters) and some remnants remain. The grounds are maintained well and the utilities worked fine. Most spaces were impossible for our 43' bus, but we got a pull-thru that worked. Corners of the concrete pads have been broken off. The staff was friendly and efficient. The location is great for walking to the beach and all the tourist attractions along the beach road. The wifi is inadequate, but there is a library with good wifi across the street if you need it. The pool is clean, but the furnishings around it really need deep cleaning and some umbrellas are actually tattered and hanging to the ground. There is a huge amusement park next door that may be noisy in the summer months, but it has lots of fantastic water attractions. The park has many tall pine trees, Magnolias and shrubbery that insulate it from street noise a little and provide shade. Loved the lily pond and listening to the croaking of the frogs at night! We camped at Raccoon River Campground in a Motorhome. The staff is excellent. The grounds are clean, lots of pine trees, very rustic and private. We did not use the restrooms but checked them out: out-dated and in need of severe TLC. We camped at Raccoon River Campground in a Motorhome. Short walk to the beach and restaurants. We ate lunch at Shrimp Basket the food was good and our server was great. Dinner at Skooners, excellent, great sunset view, friendly staff, great management. I bought a wind breaker from Skooners which is a must when visiting the Florida beaches. We did not have a reservation but received a friendly welcome, offered seniors discount and given choice of site. Site has lots of pine needles and cones as there are huge pine trees. Walking distance to the beach, two pools and children's playground. We camped at Raccoon River Campground in a Travel Trailer. Sites near Middle Beach Road have quite a bit of road noise. Be aware that pine cones fall and may land on trailer roof or a person. Rate for 3 Adults. Have stayed here before. Park very handy to holiday destinations, short walk to beach, close to all shopping. 2 great pools and very good laundry. Bathrooms were not the best tho. Had a good site with good wi-fi and cable. Stayed in 38ft motorhome with tow. Would stay here again. We camped at Raccoon River Campground in a Motorhome. We have stayed here one time many years ago. We went in June the sites are very small had trouble getting into a few. Watched others RV rigs trying to get in a few sites also. Very good location to beach, nice pools, staff very nice. Bath houses not so good very old and not clean and very small felt very confined. Same piece of trash was in the shower the entire week. I did complain to staff. I would stay again although. We camped at Raccoon River Campground in a Fifth Wheel. Management and staff are very friendly. We got in at night and someone helped us find our site, though they didn't actually seem to know where it was. It is very shaded which is nice, but the spots are just grass and dirt so they aren't very level. The park itself was quiet and we felt very safe here. If it weren't so expensive, I would probably return. We camped at Raccoon River Campground in a Travel Trailer. There is so much to do in this area! Nearby are shopping centers which have anything you might need. Many restaurants in the area. Are you affiliated with Raccoon River Campground ?